This one is a classic. I mean really: Who hasn’t eaten beef stroganoff? I’ve seen (and eaten) so many versions of this French standby (yes, despite the name it’s a French dish) that I’ve lost track. They’ve ranged from horrible — cream of mushroom soup and hamburger — to sublime renditions done with care and with great ingredients. I hope you find this recipe one of the latter. 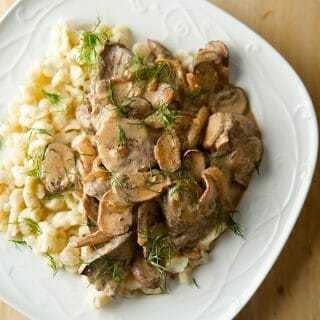 Stroganoff has traditionally been made with quality meat, sliced thin. That means cuts like sirloin or even filet mignon in beef. Hamburger versions are OK, but not my thing. With venison, thinly sliced pieces of backstrap mixed with mushrooms, shallots, dill and sour cream are the ticket. This is filling, easy-to-eat cool-weather food of the first order. Know that there is huge variation in stroganoff recipes. A few things are pretty consistent, however. To be a proper stroganoff, you must have thinly sliced red meat — beef, lamb, venison, elk, etc. — sour cream, mushrooms, some sort of onion, and butter. Lots of butter. What to eat it with? Well, historically it’s been French fries, believe it or not. But here in America stroganoff is almost always served with egg noodles. This tastes great, but is brutal to photograph. (I think Holly did a great job with these photos, no?) So I went with Austrian spätzle, which are a lot like egg noodles. You can do whatever, but I really like the way the stroganoff matches with the little spätzle dumplings. And if you don’t want to make these plain Jane spätzle, try my pumpkin spätzle or nettle spätzle, which can also be done with spinach. 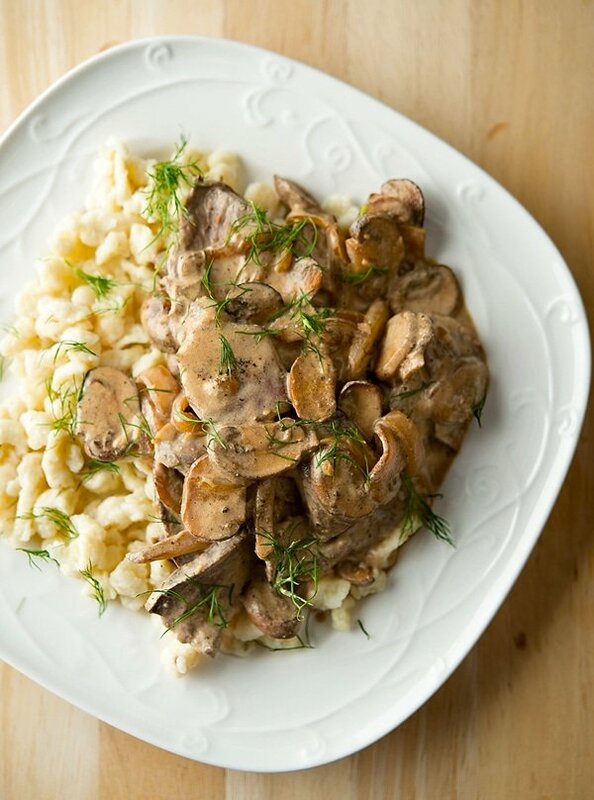 My version of venison stroganoff relies good, fresh mushrooms, shallots, a splash of Madeira wine, and both fresh dill and a rarer ingredient, dill pollen, which you can omit if you can't find it. As for the dairy, butter is the fat and sour cream is the sauce. Can you loosen it with some heavy cream? You bet. Sometimes I do, sometimes I don't. I did not in the photo. I make the spaetzle first. These can be made up to a day ahead and stored in the fridge. Mix all the ingredients except the heavy cream together in a bowl. Now thin the sticky dough into a batter that is a bit like really thick pancake batter with the heavy cream. I use a Spaetzle Maker to make my spaetzle, but you can either use a colander with wide holes or just flick the dough/batter off a cutting board with a knife. Get a kettle of salty water going over high heat. Once it boils, make the spaetzle. Boil them hard until they float, then 1 minute more. Skim off with a slotted spoon or a spider skimmer. Move them to a baking sheet. When they are all made, toss them with a little oil so they don't stick together. To make the stroganoff, salt the venison well and let it sit on the cutting board for 20 minutes or so. I do this while I make the spaetzle. Get 2 tablespoons butter in a large saute pan good and hot over medium-high heat. Pat the venison dry and sear all sides well in the butter. Cook it until it's rare to medium-rare. If you don't know how to determine this, use the finger test for doneness. When the meat is ready. move it to a cutting board and let it rest. Add the mushrooms to the pan and turn the heat to high. Soon they will give up their water, and when they do, use a wooden spoon to scrape up any browned bits from the bottom of the pan. When most of the water has boiled away, add the rest of the butter to the pan along with the shallots and saute everything for 3 to 5 minutes, stirring often. Add the garlic, toss and cook over high heat for another 3 minutes or so. Sprinkle some salt over everything. Add the Madeira and toss to combine. Let this boil down furiously. While it is doing so, grate some nutmeg over the mixture. When the Madeira is mostly gone, turn the heat down to low. Slice the venison thinly and return it and any juices that have collected on the cutting board to the pan. Stir to combine and add most of the chopped fresh dill. Stir in the sour cream and turn off the heat. Stir to combine and let it heat through from the heat in the pan. Do not let this boil, or even simmer, or Very Bad Things will happen. Think nasty curdled crap. To serve, spread out over the spaetzle and top with any remaining dill and the dill pollen, if using. 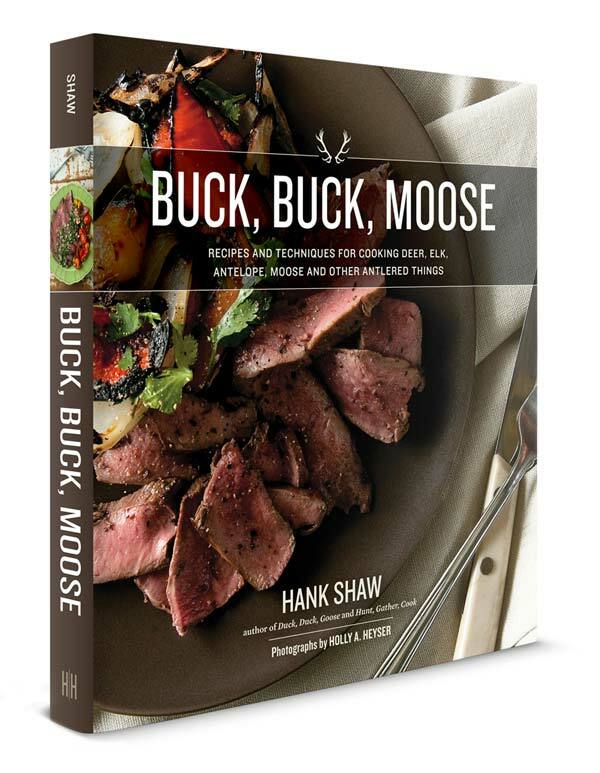 You can find nearly 100 recipes for all varieties and all cuts of venison, right here on Hunter Angler Gardener Cook! My husband said this is the best stroganoff he’s ever had. I made some substitutions like regular onions instead of shallots and white mushrooms I had on hand, etc. but it still turned out great. Unfortunately I fell asleep and woke up too late to make the spaetzle but I can’t wait to try that next time. We served it over egg noodles. Thanks for the recipe! I made this the other night and it was incredible! I wondered if it would be possible to make this in the slow cooker for days when the schedule is more packed? Vet2Be: Sorta. You can’t make this version, because the meat is still pink inside when you eat it. But you could sub in ground venison and it’d work fine. Vet2be: don’t use ground like he said. 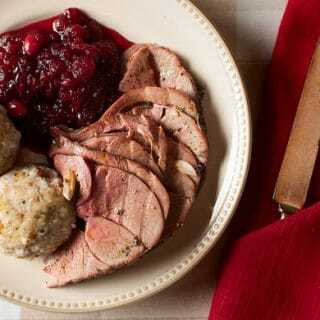 Use roast meat to slow cook over hours in a crock pot, it will shred apart like classic beef stroganoff does. Use some heavy cream in the crock pot and add sour cream at the end. Absolutely delicious Hank! I have made this twice and using the backstrap is the best. So Tender. I love the taste of the Sherry wine paired with the fresh dill. Great Job. Will make again soon.